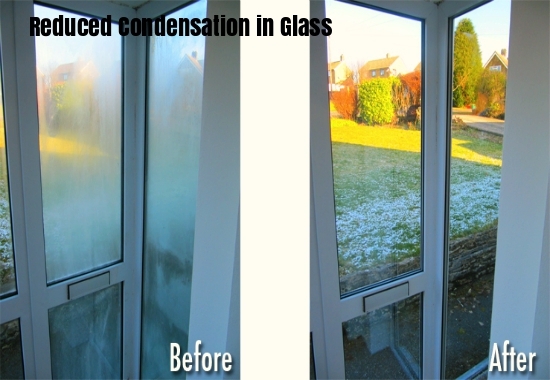 The basic reason for condensation is when warm moist air meets cool dry air. This temperature difference causes the fog or steam. Most window materials used are designed to keep cold air from entering the house. This also means that warm moist air is retained inside the house. This difference causes the condensation on glass. Yes, it can. Simple solutions like airing the house once a day, running exhaust fans in the kitchen and bathrooms, and opening drapes and windows to allow air to circulate against the window work to a certain extent. You could also get a dehumidifier installed. Adding storm windows or replacing windows with insulated glass windows can also help in reducing condensation. You may need to call in an expert if you see condensation between the two layers of glass in an insulated double-pane glass window. This could mean that the airtight seal has failed and the glass will need to be replaced.